Patients and families at CHOC Children’s Hospital spend time with Orange County SC players and Soccer For Hope Founders. CHOC patients and families spend time with Orange County SC players and Soccer For Hope Founders. 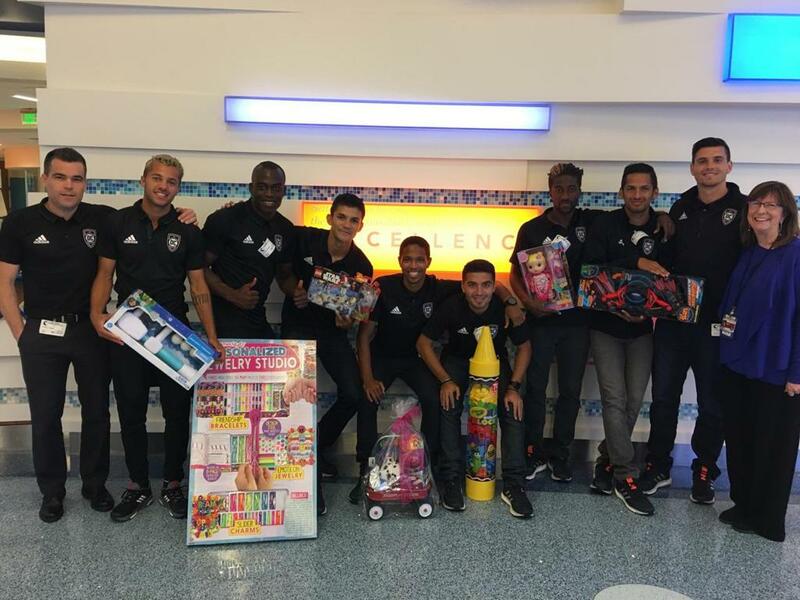 IRVINE, Calif. (April 14, 2017) – Eight Orange County Soccer Club players and representatives of Soccer For Hope were eager to spend an incredible afternoon bringing cheer to patients at CHOC. It was an afternoon filled with fun and laughter for Orange County SC players who spent the day getting to know the incredible children and their families. Goalkeeper Charlie Lyon, defenders Joe Franco, Beto Navarro, Sola Abolaji, midfielders Victor Pineda, Jerry van Ewijk, Ami Pineda, and forward Duke Lacroix went from room to room handing out gifts, taking pictures and signing autographs for patients and their siblings. The time spent with the children meant as much to Orange County SC players as it did to the patients and their families. The team partnered with Soccer For Hope who has raised over $3 million dollars for hospitals and foundations nationwide to aid in childhood cancer research, awareness and essential family support since its inception in 1998. Side by side they handed out gifts to the children and helped to make a difference in the lives of the families. The Orange County Soccer Club is Orange County’s Professional Soccer Team. The club was one of 12 founding members of the new United Soccer League (USL) in its inaugural 2011 season. Established in 2013, the predecessor club Orange County Blues were the 2015 Western Conference Regular Season Champions and have reached the Western Conference semifinals of the USL Playoffs in back-to-back seasons. The club’s brand-new owner, James Keston, is the Chief Investment Officer of LARO Properties, and will actively oversee all operations of the USL club in Orange County. Keston is dedicated to transforming the club into a world-class professional soccer organization that focuses on the fans, players and youth clubs of Orange County. Soccer For Hope is a non-profit organization founded by Oliver and Jamie Wyss in 1998. The organization has been driven by their goal to raise desperately needed funds and awareness for children with life threatening diseases. Since its inception, Soccer For Hope has benefitted thousands of children and their families across the U.S. In the last 20 years they have raised over $3 million dollars for hospitals and foundations nationwide. They host a variety of events from soccer camps & inspiration walks to gala dinners & movie screenings. Please help Soccer For Hope make a difference today! Visit www.soccerforhope.org to learn how you can contribute today.